On October 17, the Cancer Moonshot Task Force released a report laying out its implementation plans for accelerating progress in cancer research and care. The plan includes actions launched under the Cancer Moonshot this year as well as longer-term strategies for the initiative. Established by President Barack Obama, the Task Force consists of 20 federal departments, agencies, and White House offices, with leadership provided by Vice President Joe Biden. The Task Force’s efforts are not intended to supplant existing cancer programs, initiatives, and polices, but to coordinate these efforts in an attempt to quicken the progress associated with them. The report contains five strategic goals: (1) catalyze new scientific breakthroughs, (2) unleash the power of data by “maximizing access to and usability of these data to enhance, improve, and inform,” (3) increase the pace of new therapies, (4) strengthen efforts surrounding prevention and diagnosis, and (5) improve patient access and care. The Task Force notes that the plan is designed to serve as a blueprint for future Administrations (the report was released before last week’s elections). It also includes new commitments made by both the public and private sectors. The Patient-Centered Outcomes Research Institute (PCORI) has released its plans to support the Vice President’s Cancer Moonshot Initiative. PCORI’s National Patient-Centered Clinical Research Network (PCORnet) has committed to (1) enhancing its national data network to facilitate large-scale cancer research; (2) creating data tables that describe characteristics of patient cohorts treated for the most common types of cancer; and (3) establishing a Cancer Collaborative Research Group within PCORnet to assist in identifying research questions, developing approaches to integrate big data in cancer prevention and treatment, and reducing disparities. More about PCORI’s support for the Cancer Moonshot is available on its website. On February 1, the White House announced a new $1 billion initiative to jumpstart the new national “moonshot” initiative announced by President Obama in his 2016 State of the Union Address. The President established the White House Cancer Moonshot Task Force via a presidential memorandum, which will be led by Vice President Biden. The goal of the initiative is “to eliminate cancer as we know it.” The Task Force’s membership will include the leadership of the Departments of Defense (DOD), Commerce (DOC), Health and Human Services (HHS), Energy (DOE), Veterans Affairs (VA), and the Office of Management and Budget, National Economic Council, Domestic Policy Council, Office of Science and Technology Policy, Food and Drug Administration (FDA), National Cancer Institute (NCI), National Institutes of Health (NIH), and the National Science Foundation, among others as designated. NIH is directed to provide “funding and administrative support” for the Task Force. 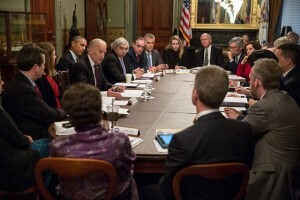 Additionally, the presidentially-appointed National Cancer Advisory Board (NCAB) is directed to also serve on the Task Force and is “strongly encouraged to establish a working group consisting of a Blue Ribbon Panel of scientific experts.” The Task Force is charged with producing a detailed set of findings and recommendations and delivering a report to the President before December 31, 2016.